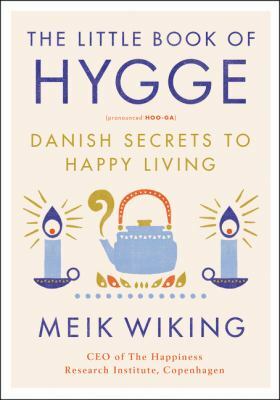 The little book of hygge : Danish secrets to happy living (pronounced Hoo-ga) is a charming and informative book about the art of happiness. Wiking is a professional in this topic (he works at a think tank called the Happiness Institute in Copenhagen) and this book is backed with many studies though his work. Hygge is loosely translated as emotional coziness, comfort, togetherness, and well-being. It's manifest in your environment, activities, food, decor, and outlook on life. Hygge is a savoring of all things delicious and comforting--a way of life the Danish have mastered. As a seeker of coziness, happiness and learning about my own Danish roots, I was intrigued by how many aspects of hygge I already partake in. I love wools socks, cozy reading nooks, warm comfort foods, snuggling in blankets, tea, smaller intimate gatherings, candles and open fireplaces. The Danish world painted by Wiking is idyllic, and seems rather unattainable in American culture, but parts can certainly be applied in daily life for all. This book is loaded with Danish-English compound words so listening to the audiobook would be my recommendation to avoid confusion. Also try to avoid getting annoyed by his more bookish technical parts, or by how often he says the word hygge. Overall, a wonderful approach to seeking simple happiness in daily life. PS Shaina wrote a blog post about the many Scandinavian books published recently. Check it out!